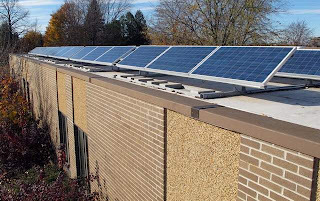 Sheboygan aldermen will get their first look Tuesday night at a proposal to install solar panels on city buildings at no cost to the city and would hopefully lower the city’s electric costs. Members of the city’s Sustainable Sheboygan Task Force, which examines ways the city can operate in a more environmentally friendly way, and representatives from Arch Electric in Plymouth will make the presentation to the council’s Committee of the Whole at 5 p.m. in the third floor council chambers at City Hall. The key to the proposal is using a financing plan in which the city would lease the panels from Arch Electric. The energy savings would be greater than the lease costs, said Jennifer Lehrke, a local architect and task force member. The task force is recommending that the council finance a study to see which buildings would be the prime candidates for solar panels. Lehrke estimated the study would cost less than $5,000. Lehrke estimated the study would take two or three months to complete. If adopted, the plan would would be the first in the state, she said. “We would be a forerunner in the state. It’s a way to distinguish Sheboygan, probably the first of its kind in the state,” she said. Arch Electric owner Ed Zinthefer confirmed that. “It’s never been done in Wisconsin,” he said. His company has installed solar panels on a number of local projects, including the Maywood Environmental Center and at Ebenezer and First Congregational United Churches of Christ. Former Common Council member Jeanne Kliejunas, also a member of the task force, said Arch Electric is one of the most experienced solar installation companies in the state that until now has worked mostly with private clients. “They would like to expand into the municipal market,” she said.